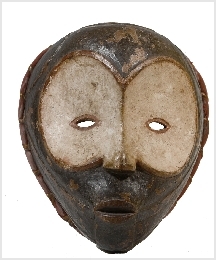 Finely carved wood mask used for traditional ceremonial dances, worn by members of the Lega tribe in front of the chief. Small slit eyes with large circular design with protruding mouth and forehead. Nice patina throughout. 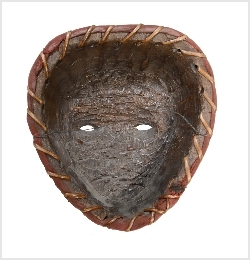 Red cloth tied with raffia string on the periphery of the mask.